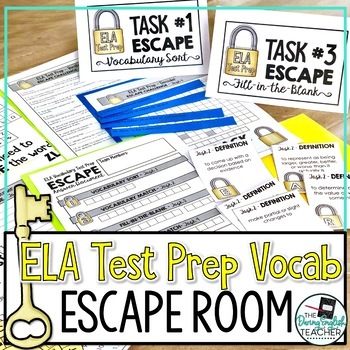 Help your students learn and remember critical academic vocabulary words frequently used on high-stakes tests with this ELA Test Prep Vocabulary Escape Room Activity. 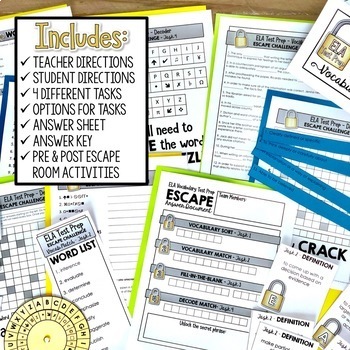 This download includes teacher directions, student directions, and all of the printable resources necessary to hold an escape activity in your classroom. 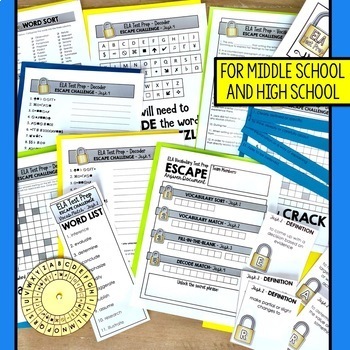 Introduce the 40 words includes in this Escape Room to your students with a word sort. This will allow them to think about their knowledge of the words. 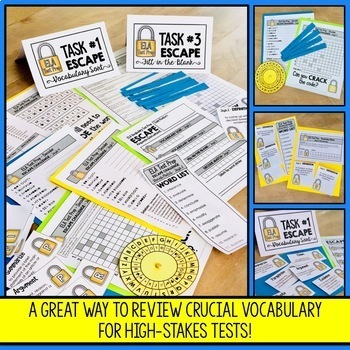 Students will complete four different test prep, vocabulary-focused ELA tasks that rely on matching words to definitions, sorting words, unscrambling words, and demonstrating the meaning of a word. Throughout these four tasks, students will apply words in different ways to actively learn the words. Conclude the escape activity with a quick write reflection and word association activity. These post activities will help reinforce the content of the ELA Vocab Test Prep break-out activity.